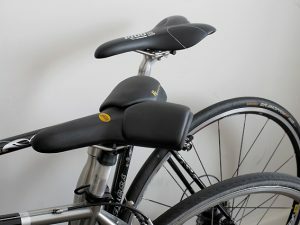 “I put my seat (R2, PCF edition) on an indoor trainer and was pleased that my bottom no longer suffered from the numbing effects that most other seats impart. I’ve only recently put it on my road bike and although it does take some adjusting I’m pleased to report it too feels better. I don’t call RIDO R2 a ‘saddle’. As I think of it a bit, I’d rather employ the term of a ‘perching post’. Gravity helps the rider of an ordinary saddle to find and maintain the correct position. This is not the case with R2. R2 operates more likely as a bird on the line. In the balanced position, gravity works in favor of the bird providing maximum of comfort. However, in any other, it works against it so the bird needs to invest a certain amount of energy to restore balance. Truly, it takes some time to get accustomed to R2, i.e., with respect to the stated above, to maintain the singular position that provides comfort and security. In the beginning, I wasn’t aware of the peculiar nature of R2 nor did I follow the setting instructions to the letter. Instead, I wasted my time trying to adjust R2 to the architecture of my body instead of doing otherwise. Definitely, the right approach is to begin with setting up the height and the distance of the saddle from the handle-bar while keeping it ‘dead horizontal’. Then, a novice to R2 has to spend some time accommodating to R2. After a couple of weeks, he/she might tweak the saddle nose a bit up or down in the last attempt to make the things even better, but that’s all. In a word, there is no reason for the rider to pedal around with a spanner repositioning R2 too often as I did. As for a ‘short ride’, that is, the rides that last less than 60 minutes, things are crystal clear: R2 does not cause any discomfort. What about a ‘long ride’ experience? But, firstly, what is a ‘long ride’ all about? Any ride that keeps the rider on the saddle for more than 60 minutes I consider as a long one. How does R2 affect the rider’s body after an hour of riding? Does it cause any discomfort or even hurt? Yep, it causes discomfort but never hurts. I mean R2 never induces numbness or the pain in the perineal area. Is it possible to elevate discomfort caused by R2? Yes, of course, with ease. On the first sign of uneasiness lift your buttocks off the saddle to pump the pedals upright for a while. It usually does the job and alleviates the problem quickly. There’s, however, another procedure I prefer. Since I do not ride against chronometer or to humiliate my fellow bikers, on the first signals of discomfort, I get off and walk my bike for a couple of minutes enjoying the scenery. Then I get ready for another round. Applying such a procedure makes the 30-40 miles of cycling a joyful experience. In a word, RIDO R2 is highly recommend to those who appreciate riding comfort but particularly to those with prostate issues. RIDO R2 is a revelation. 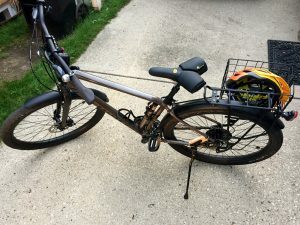 It, literally, saved my cycling habits. Due to some prostate issues, without RIDO R2 saddle, cycling would have become a part of my personal history. Truly, it takes some time to get accustomed to extraordinary features of R2. Yet, once it gets over, the rider is to enjoy unprecedented comfort R2 offers particularly during long riding tours that take more than an hour on the saddle. “Yep, you’re right I became a fan of that peculiar device of yours. As for long rides, mile by mile, I get more and more accustomed to extraordinary features of R2. Yet, do not make the greatest mistake. I enjoy walking my bicycle. I mean I’m not forced to do that. It’s my hobby to study the spaceship we call Earth. “Concerning the rido saddle I have buyed. Yes indeed I have already made some test tours. The first one was just a short trip of appr. 20 km but the second one was a ride of appr. 80 km without any break. The saddle gives an awesome riding comfort without any pressure pains especially at the tailbone. Because I am one of the most well known materials quality tester in Germany I will do in sommer time an extraordinary tour around the Lake Constance followed directly by riding along the river Neckar. This tour will have a total distance of about appr. 800 km and after this I can give you an absolut response concerning comfort and usage property of this saddle. Would a Thudbuster or Suntour SP12-NCX be counter productive? All I can say after 8 blocks in the rain is Wow Good!!!! “Hi, I have just ordered a black Rido saddle for my husband. I have been using a Rido saddle for the past 18 months and after the benefit of such a great saddle I am purchasing one for his bicycle. My daughter ordered my Rido saddle from the UK when she moved over there. “I can’t say how much I have appreciated how good this saddle is. 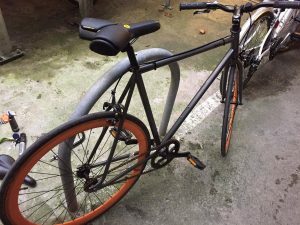 I converted my bicycle to electric assist and was struggling to have a comfortable ride because of a tailbone injury while a teenager. When I found the Rido website and read the reviews I asked her to see if she could get me one, and always one to support a good cause she purchased the R2 white and blue Prostrate Cancer one for me. Your service was amazing, it took less time for my saddle to arrive in New Zealand than it did for the saddle I was waiting for at a local bike shop. So, of course, I cancelled the order from them when yours arrived. It was great to be able to track the progress of my order as it came out from the UK. “I just want to thank you again and look forward to the saddle arriving for my husband (he has a birthday coming up and I would like to surprise him with the R2 for that on 16 November). “I’m glad you asked. Are you kidding? This is the best saddle ever! No more numb crotch areas. It took a little getting used to but it’s very comfortable and I do up to 50 miles on it. I’m sure I’ll have no problem doing a century ride on it. My sit bones perch right atop the ridge before they fall over the back. “Hello, Just wanted to let you know that the saddle has been amazing. 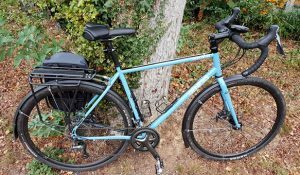 I have 15cm ‘sit bones’, which is well outside the norm, and I thought that I’d never get a saddle that I could be comfortable with while on my cycle trainer. “As said before the one I bought earlier this year delivers comfort levels like never before. “The saddle is very good. It takes the pressure off the pelvic area very well indeed. It also looks good and was complimented by the technician in Halfords. Have you thought of getting them to stock it? 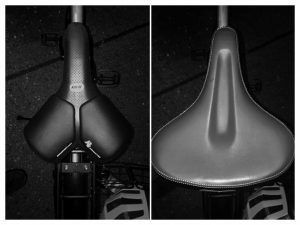 “Only managed one ride on the Rido (R2) so far but I have to say there was a notable shift in comfort versus my other saddle. Certainly takes the pressure of the soft bits which is exactly what I needed. Hope to get out more when the weather gets better. “Getting on great with my R2 saddle – no more pain! – the second one I’ve owned! I currently do a 10 mile daily commute to work on a mixture of bad roads and gravel paths. Before the R2 I used to get numbness and perineal pain using all other saddles, (ones that came with my bikes and some expensive aftermarket options). Now there is no more pain and I find my commute a breeze plus easily manage to do weekend rides of 40 to 60 miles with no discomfort whatsoever! Love it and have just purchased one for the wife! I have attached a photo of my current ride.